365 days of no lost-time injuries. A fantastic result! Hamilton branch production department celebrated 365 days of no lost-time injuries. Alsco Hamilton is very work safe focused – a reflection of this fantastic result. 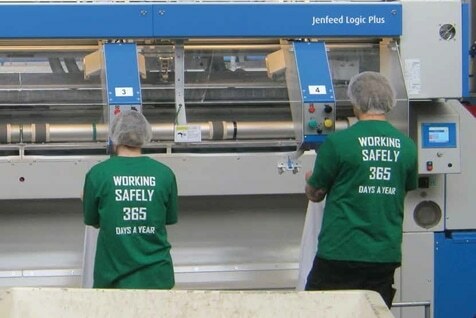 We celebrated this milestone with a staff lunch where we gave each staff member a goody bag which included a t-shirt with the logo “Working Safely 365 days a year”. The teams at Alsco Hamilton start each day with a Greenroom meeting and high on every agenda is a discussion around accidents, near misses and hazards identified. Hamilton’s Health and Safety committee meet once a month and manage any concerns or near misses. Our staff are the Alsco Hamilton family and as everyone knows family safety is at the top of the list. Healthy and safe staff are happy staff. We take health, safety and the environment very seriously and our next goal is to make it to the 31st of December 2014 without any accidents. We have called this “Project 14” because it has been scientifically proven that giving something a cool name substantially improves your success rate.